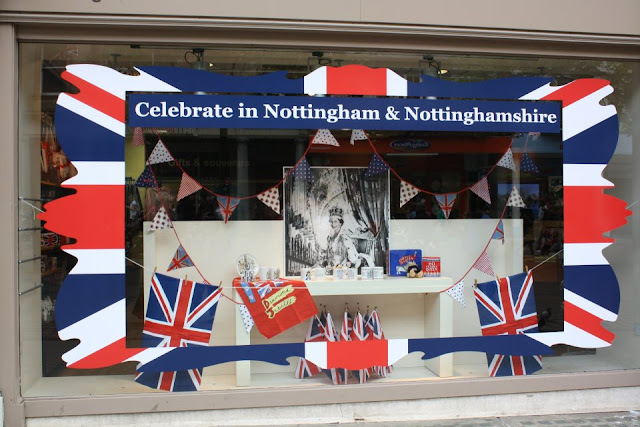 'As the Capital of the East Midlands, it's great Nottingham's playing host to this Royal visit. I'm sure that local people will give the Royal party a warm welcome and will be excited about getting to see The Duke and Duchess of Cambridge as part of the Jubilee celebrations'. 10.05 a.m. The Queen will arrive by train at Nottingham Train Station where they will be met by William and Kate. Both parties will travel by car to the Old Market Square. 10.10 a.m. The Royals are expected to arrive in the Old Market Square and will spend time greeting the crowds, before going into the Council House to meet the Lord Lieutenants of Nottinghamshire and Derbyshire and invited guests. 11.00 a.m. The Royals will arrive at Vernon Park for a rededication of Vernon Park under the auspices of the QE2 Fields in Trust Organisation, of which William is patron. Her Majesty will then unveil a plaque to mark the park's new status and the Royals will enjoy sporting and musical performances. 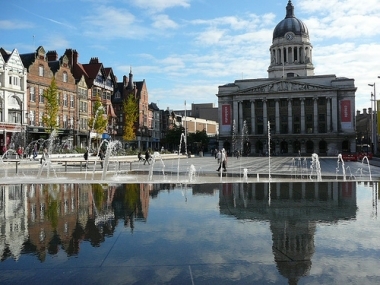 A look at Nottingham city centre. William enjoyed a night out with his close friend Guy Pelly at a private members club in Mayfair. Prince Harry recently joked William and Kate had become a middle-aged couple, preferring home cooked meals and DVDs in their Anglesey home than a night out on the town. Noticeably Kate was absent, possibly opting to have an early night as opposed to staying out late. I was struck by the number of negative comments. William is only 29 and entitled to relax with his friends. To view photos of William leaving the club pop over to the Daily Mail article. Meanwhile, Kate is reportedly busy planning to throw William a 30th birthday party 'fit for a King'. She is thought to be discussing ideas with William's closest friends. Kate chose to celebrate her 30th with a low key family dinner. It will be interesting to see plans for William's come to fruition. This week's issue of Hello! 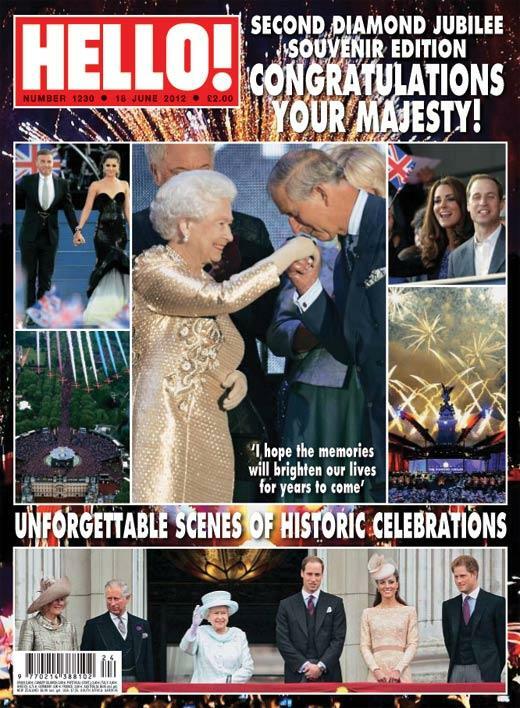 Magazine is a souvenir edition of the Jubilee events. Charlotte, thank you for accepting my suggestion about the story of William at the Mahiki nightclub with friends, but without Kate. Initially, the comments in the Daily Mail seemed positive, after all he's only been 29 years old and the fact could be a preview of the celebration of his 30 years old birthday. Moreover, many people, like me, think normal married men out, from time to time with his friends to talk, drink, etc... But with the passing of the hours after the publication of the report, began to emerge many nasty comments, unfortunately. I hope that the visit of William and Kate in Nottingham is a success and bring us very happy moments. Kisses! Can I ask you something? Are you the owner of an Instagram account named hrhduchesskate ? Well, I think there is nothing wrong with William enjoying a night out with friends. In fact it's quite normal to do this from time to time, also if you are married - you don't need to be glued together 24/7! If it's ok for a couple that both enjoy time with their friends without their partner, it should be ok for everyone else. Sometimes I read the comments of the Daily Mail articles and frankly, very often they are quite hateful and stupid. There seem to be a lot of people who are bored and/or jealous and take advantage of the anonymity in the internet to post unfriendly comments that are full of assumptions no one can prove. And the Daily Mail has really a talent for blowing up a story out of nothing. It must be quite annoying and even frightening if you are in a position like Kate or William and you have to see that such nonsense is written about you or your family. With all due respect, I have to disagree. While it is appropriate for a married man to spend time with his friends at sporting events and the like, that particular sort of venue was not really a good choice. From all that I have read, that particular "friend" has not been the best of influence on William. Unfortunately those photos not only made William look foolish, but I felt they were and embarrassment to his wife and very disrespectful. I am going to agree with Anonymous. William looks seriously drunk and this is not the way that one would expect somebody with his position to behave. I understand that he may have wanted to have some fun of that sort when he was young, but now it's time to grow up. I simply don't think it's appropriate for the future king of England to go clubbing with people like Guy Pelly while his wife is home and probably sleeping. Of course she wouldn't wanna join him there! I am pretty sure that she will never go clubbing again (except maybe, if it's one of her friends birthday party). why? because she does know how to live up to her position! Mm, I must agree I have mixed feelings about the night out. I was wondering how the jubilee event affected William. It was obvious that the Queen had her first three in line to the throne with her all the time and not the whole family as usual. This was a statement as to the future of the throne. The enormous responsibility and commitment of that position was on the forefront and it must have been on William's mind as well...it is still waiting for him and the pressure is getting more and more for him to take on his duties as a senior royal and heir to the throne on a fulltime basis. Maybe that is what made him decide on a night out? Something else, did Kate's breasts not look bigger in the red dress on the Thames pageant? And with her leaving the after party earlier and all - I am now also wondering whether she is not perhaps pregnant? Her posture is not the same to me as always and though she is still thin she does not look so skinny anymore. Just wondering. I agree with Anonymous and Louisa about William not looking very good on these photos. But the key point here is, in my opinion, why a photographer has to follow William (or other members of the royal family, for that matter) in his free time, even during the night, and take photos. I always thought that this is disrespectful, harassing and unnecessary. Then again, I live in a country without royal family, and where privacy for well-known persons is fairly well guaranteed, so I’m still not really used to this form of journalism. Of course I know that these photos are taken because there is clearly an interest to see them, otherwise the photographers and newspapers couldn’t make money out of it. I popped over to the Daily Mail site myself to see them. But quite honestly, I would generally prefer not to see such photos and will avoid it in the future. Photos from events like the wedding last week-end are ok (although they were also being taken during their free time, I know), but photos like these are going too far in my opinion. Concerning the friend with whom William was at the club, I don't know anything about him (heard his name for the first time today) and I can't say whether he is good or bad influence on him. However one would expect the second in line to the throne to choose his friends carefully. I think as now these photos have caused such an excitement, we are not likely to see William again in such a situation - all the better. Anonymous and Louisa, when I saw the article at DM for the first time, I was tempted to think the same as you, because I was one of those who found the behavior of William and Kate, during the jubilee of the queen, weird. But, I'm a married woman and I know how a couple relationship, so I prefer to see things with caution and wait to see how William and Kate will behave in the coming days. Only then we will have a better idea of what might be happening between the two. Kisses! Yes, Claudia, I agree with you. Only if this behavior persists for William several times is that I will actually find it somewhat problematic or immature or denotes marital problems. Let's wait! I have read the comments here and I agree and I disagree with them. First I don't know if any of you have seen the pictures of the beautiful Duchess and her Prince at the weddingover the weekend. If not you need to see them. It show's the Duchess & her Prince "together". William was so protective of her, he had his hand on her back in most of the pictures. They looked in love with each other. Then they had their movie date. I have mixed feelings of a married man (not just William) going out clubbing without his wife. There are always women looking for whatever they can get no matter if the guy is married or not. Same goes for the guys too. I am not saying William was out looking to cheat on his wife which I don't think he would ever do. I am just saying that things happen. There has not been anything said about him dancing or whatever except just looking at him you know he was very drunk. And for all we know the Duchess was ok with this. We just don't know. So I don;t think we should be saying things that there might be problems in the marriage. And remember I think this must be the first time William has gone out with a friend since they were married. I think that it is absolutely ridiculous and juvenile to draw conclusions about the state of their relationship based on hand placement. So just because he looks at her and has his hand on her back they are in love, and when he doesn't you then speculate that there is trouble ? There is no way to know what is going on in their relationship and it is silly to speculate one way or another. Proclaiming that they are "in love" is as baseless as saying that they are not. All healthily married people take time to go out with friends. It says squat about who they are as people and the chances of the marriage surviving or cheating and blah blah blah. It says NOTHING. It is what it is - a husband spending an evening with a male friend. Anything beyond that is your fertile imagination. Wow! I just googled the pictures of William's night out and I have to say, he really does look drunk! Sometimes I think about this 'crisis' that some people believe to be happening between them... And I don't know, isn't it something people are 'buying' from the media? And we can't be 100% sure that Kate was at home, sleeping. Maybe she was also having a girls' night out, but a more quiet one? Exactly because so many speculations, is that I prefer to wait a little longer to see what the future will say about the relationship of William and Kate. @Ana B. from Brazil- I agree with you that the media is making so much of this. Like I said in my post above that his wife might not mind that he went out, we don't know. I do not believe there is a "crisis" going on. We as fans only have the media and pictures to base our judgment on. And we know pictures only tell a small part of what is going on. And I do agree with you again on what his wife was doing. The papers said she was at home, who know's what she was doing or where she was. Again it is the papers makinga big to do about this. Hi, Charlotte! These past few days I've been feeling that some readers replying to some comments have the need to be rude. I don't know what is going on, but we have always had an amazing enviroment here, sharing our thoughts and opinions, very politely and respecting each others opinions. Even though we didn't agree with each other, we have always shared our point of view in a very kind way. And lately I have noticed that some readers are not in favor of the 'constructive discussion' you encourage here. Ana - Thank you for bringing this to my attention. I had no idea those comments were being directed at Pauline (who is an immensely valued commenter on this site) As always I encourage constructive discussion but will be monitoring more closely from now on deleting abusive/attacking/hateful/trolling comments. Thank you again Ana. Actually I didn't mean Pauline was the only one receiving nasty replies, I just used her as an example on this post. She just wrote what was on her mind and someone answered in a very rude way. These things have been happening since your last post. Some readers made their comments and were replied in a very bad way. Some may disagree, but I think some people may feel 'cornered' and stop posting. Just a thought! Sorry to bother you! Thank you, you are an amazing person! Charlotte, Maybe if you take away the selection of "anonymous" and make everyone reply with a name. @Ana B. Thank you for the nice comment. And Charlotte thank you for the nice comment. I love your blog and I get very up set when people write things about the Duchess & her Prince that they read in the media. We don;t know what goes on in their private lives. We only know what is written about them and the things that you write. You have the best seat in the house with living in the UK so you get things first hand. So I say to the one's who write nasty comments, if you have nothing nice to say, don't write on this blog. Pauline I agree on every point, and I have also wondered if it could help to take away the "Anonymous" option to post, but then again, I always post with "Name" but actually I could use any name that comes to my mind (I use my real name though). We can just hope that these few readers who can't be friendly and respectful will stop posting by themselves or change their behaviour. I'm also sorry for you Charlotte because you do a great job here and you are a wonderful person, you don't deserve having to deal with all that. Thank you for your excellent work. I don't like this type of discussion here. A lot of comments sounds a little bit aggressive...also in the post before. Please stop to discuss about every single word. I think it's ok to say "I don't like this or that" and another person has a different point of view-like it was in the other posts when we discuss about her outfits and so on. But if we digress too much and always discuss and translate every single move from them...we are not better than the yellow press (with their pregnancy rumors). fiona, I totally agree with you. Also on the topic about William's and Kate's marriage. I think no one of us here knows them personally so actually we can't know what is going on in their marriage. We can only speculate and as you say, if there is too much speculation, we behave like the press who blows up stories out of nothing. I have thoroughly thought about this topic and came to the conclusion that I personally won't be commenting any longer about Kate's and William's personal life or private photos/outings because I like them very much and they should be able to enjoy their private life in peace. Ana B., that's what I noticed too and it makes me very sad. We always had such a respectful and friendly atmosphere here, even if readers had different points of view. It's like I said on the other post, it's not only what you say, but also how you say it - you can disagree in a respectful manner, there is no need to be nasty or rude. I feel sorry that Pauline and others are being attacked because I highly appreciate their opinions and thoughts. I have been a silent reader of the blog for a long time and only started to write comments recently, nevertheless I always appreciated the positive environment here. I do hope we can maintain it. Now I'm looking forward to today's visit to Nottingham :)! Hey,where are you?Kate is wearing Missoni coat and same hat she wore last year with AMQ navy coat,new clutch,not sure about shoes.Sapphire and diamon Dians's earrings. I have never been one to speculate on whether Kate is pregnant but do wonder after pictures of William at club. Could also be an early birthday celebration. Love Will and Kate but think those photos of him are unfortunate. Used to think it fine for him to go clubbing, but he's almost thirty now. Heavy drinking is a huge problem among young in UK (and US) and it would be nice if he would set an example, not hang out with today's "bright young things" at least publicly. Just gives fuel to those who don't admire the Royal Family. This is a party of a lifetime. The fireworks are fantastic. I don't see anything wrong for William to enjoy an evening out. The guy deserves to have some fun sometimes. Woah! Ӏ'm really digging the template/theme of this site. It's simple, уet effeсtive. A lot of tіmes it's very difficult to get that "perfect balance" between user friendliness and appearance. I must say that you'vе done a excellent ϳоb with this. quicκ for me on Opera. Superb Βlog!